If you like potatoes but avoid them because you are watching your blood sugar levels, try diluting the potatoes with other non-starchy vegetables. This way you get to eat your potatoes and feel satisfied but not STUFFED and HEAVY afterwards. This recipe uses eggplant and only 1 potato. It’s easy and fast–if you cube the potato and eggplant small enough (between a 1/4 and 1/2 inch cubes), they will cook quickly. Serve these with turkey burgers and a salad and you have a meal. Prepare the vegetables as described above. Melt ghee in a large skillet over medium heat. Once hot (don’t overheat or it will smoke–keep an eye on it and add 1 cube to see if it sizzles–as soon as it sizzles it is hot enough), add the rest of the potato cubes. Stir with a metal spatula so potatoes get covered in oil. Cover with a tight fitting lid for 3 minutes and then stir again to prevent sticking. Cover again for 3 minutes and stir again. Add eggplant cubes and spices. Mix well. Eggplant tends to soak up oil so you may need to add another tsp. or 2 of ghee or olive oil if the mixture seems dry and is sticking–stir well again. Cover and use spatula to prevent sticking every 3-4 minutes until potatoes and eggplant are tender. 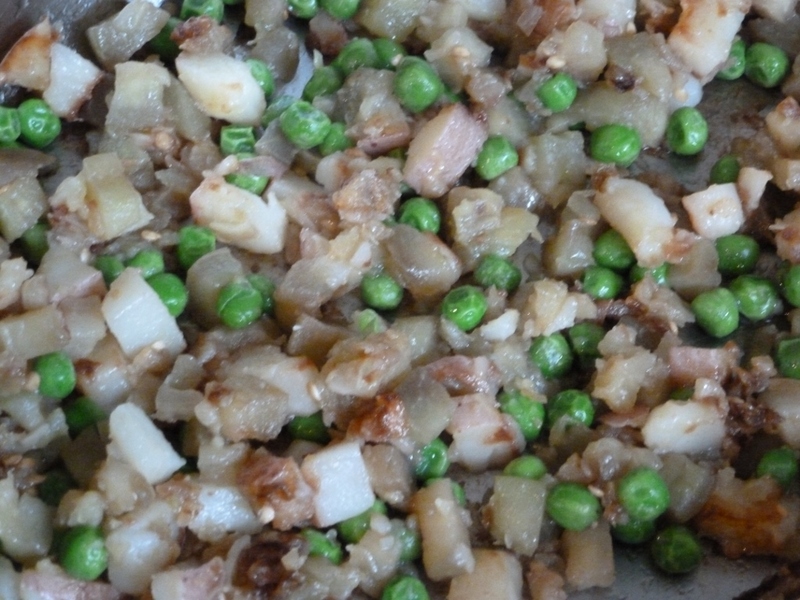 Add peas and stir. Turn off heat and cover for a few minutes. Add salt and pepper to taste. Serve immediately. For this recipe I used Japanese eggplants which are long and not more than a few inches in diameter. Their skins are not as tough and they are not as seedy as regular eggplants. I grow them in my garden but they are sometimes available at farmers markets or at the Roanoke Natural Foods Co-op. If you can get them, give this easy recipe a try. Cut off the stems and ends of the eggplants and then cut them into 1/2 inch cubes (no need to skin them). Place in a baking pan and toss with the olive oil until well coated. The eggplant tends to absorb the oil so drizzle it over while stirring to evenly coat the eggplant and use more olive oil if you like. Add salt and pepper and stir again. Spread cubes evenly over the pan. Bake in a 400 degree F oven for about 20 minutes turning once with a spatula at about 10 minutes to brown evenly. Serve hot and consider garnishing with the dry pesto mix I’ve posted previously in a green bean recipe–just sprinkle the mix over the eggplants cubes as you serve them . Serves 2-3. This recipe is a variation of Baba Ganouj without the tahini (sesame butter) . I don’t normally buy tahini because I rarely use it, so when I had an eggplant that needed to be eaten I experimented by making this dip with ground sesame seeds and sesame oil, and leaving the tahini out. I believe I like it better without the tahini! The dip is such an easy way to prepare eggplant and it will keep in the fridge a few days. Serve with vegetable sticks or a salad or spread on crackers or bread or on GF sprouted corn tortillas that Food For Life makes and which can be found in the freezer section of health food stores. Puncture the eggplants in a few places and bake at 350 degrees F for about 1 hour or until eggplants are very tender and wrinkled but not burnt. Let cool. Cut in half and slip off the skin and remove the seeds–they come in “packs” and should scoop out with a spoon readily if the eggplant is well cooked. Place the “meat” of the eggplants ( this step is a little messy but you need to trust and persevere and don’t be afraid to use your hands) in a food processor with the rest of the ingredients and process until smooth. Taste and correct seasonings. Keep in the refrigerator.